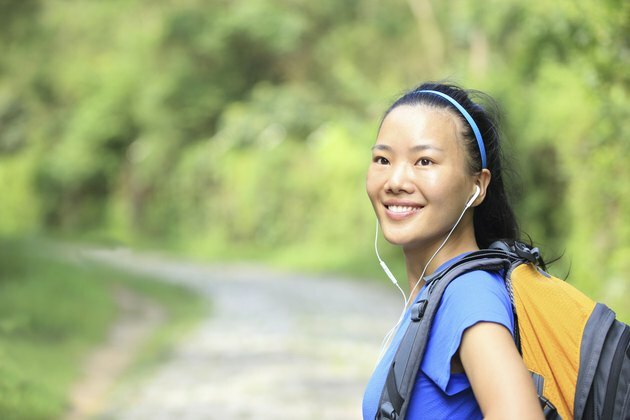 The best walking music for your workout will depend strongly on your personal tastes. There is one thing to look for, however: a consistent number of beats per minute, or bpm, to help maintain an even, vigorous pace. The Fitness Walking Guide recommends 115-118 beats per minute for beginners, 118-126 beats per minute for intermediate or brisk walkers, 130-137 beats per minute for fast walkers, and 137+ beats per minute for power walkers. Disco is a good choice for maintaining a brisk walking pace, as its tempo averages 120 beats per minute, which equals three miles an hour or a brisk walking pace. Disco samplers, podcasts and playlists abound. Some song suggestions include "Shake Your Groove Thing" by Peaches and Herb, "Hot Stuff" by Donna Summer, "The Hustle" by Van McCoy, "Lady Marmalade" by LaBelle and "Hold On, I'm Coming" by Precious Wilson. Bhangra is a genre of music most succinctly defined as Punjabi dance pop. It's popular in clubs and its beats-per-minute count also makes it suitable for fitness walking. Artists to explore include Daler Mehndi, Panjabi MC and Kamal Heer. Hip hop has a broad range of both styles and beats-per-minute counts. Look for club hits, as they often fall into the right tempo. Try Missy Elliott "Let Me Fix My Weave", Eminem "Just Lose It", Busta Rhymes "Put Your Hands Where My Eyes Could See." Old school choices include Run's "Walk This Way", Beastie Boys "She's Crafty" and Grandmaster Flash's "White Lines." Both contemporary pop and 80s pop music can be good to set your walking pace to -- especially anything that is or was popular in dance clubs. So try Lady Gaga's "Telephone", or New Order's "Blue Monday", The Black-Eyed Peas "Let's Get It Started", or The J. Geils Band's "Freeze Frame", Queue up Sheila E.'s "The Glamorous Life", Cyndi Lauper's "Girls Just Want To Have Fun", and Technotronic's "Pump Up The Jam" for some nostalgic listening. Then throw in some more contemporary hits like "Get the Party Started" by Pink, "Hollaback Girl" by Gwen Stefani, "Bootylicious" by Destiny's Child and "Hips Don't Lie" by Shakira and Wyclef Jean. Putting together a custom playlist with walking-themed music can add a little fun and diversity into your musical workout. Good choices include The Proclaimers "I'm Gonna Be (I Would Walk 500 Miles)", Dire Straits' "Walk of Life", Katrina and the Waves "Walking on Sunshine" and Fats Domino's "I'm Walkin'." What To Wear During a Basketball Game?